Lidar technology has evolved and been adapted to meet the different requirements and specification of the surveying and mapping industry. 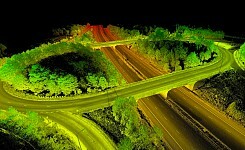 One development which resulted from the demands of infrastructural surveying sector has been 'high resolution' lidar. To meet the requirements of projects such as electricity supply network or railway corridor mapping resolutions measured in centimetres rather than metres are necessary and to achieve lidar has to be radically re-designed. Helicopter based lidar survey systems (such as Fli-map 400) were designed primarily to for infrastructural survey such but its potential for 3D modelling the micro-topography – detecting small scale archaeological features – presented exciting possibilities. Unlike fixed wing aircraft, which have a minimum airspeed, the slower speed and lower altitude at which a helicopter can operate facilitates the collection of higher resolution data. 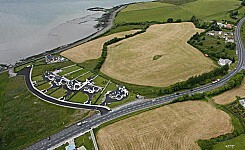 The specification of the helicopter based fli-map 400 system is listed below. All lidar systems have the potential to receive multiple pulse returns as the laser reflects from different layers of vegetation before striking and reflecting from the ground. Utilising post-processing techniques, it is possible to remove trees and bushes from the models to create a 'bare earth' digital terrain model (DTM). In the case of the Fli-map 400 system, the addition of forward and aft looking sensors increases the potential to acquire ground surface data beneath even the densest of vegetation canopies. 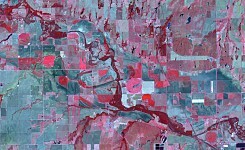 The system also captures high-resolution orthoimagery, laser intensity data, and video feed of the flight - all valuable resources in their own right. In practice the vastly increased density of the point cloud significantly increases the resolution of the resulting surface models. The image below graphically illustrates how these high resolution models compare with those from conventional fixed wing lidar surveys. However, the technology is evolving. For example the frequencies of laser sensors are increasing (resulting in higher point densities), and the Fli-map sensor is being mounted on fixed wing platforms, developments which should make higher resolution lidar data more widely available. 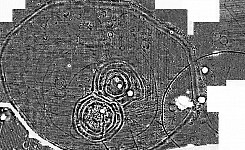 Case studies such as Hill of Tara Lidar Survey, Ireland highlight the archaeological impact of access to such data. Click on images to see High Resolution Data.